As with every new level one gets a new belt. My 4th degree belt had been worn for almost nine years. It was frayed with age; and it felt familiar. My new belt feels very different. It’s stiff and crisp; and I feel we’re yet to be fully acquainted. 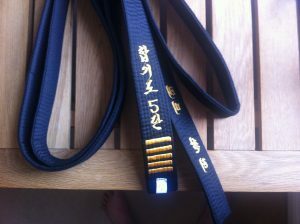 I’ve been training in Hapkido now for 31 years, but the newness of the belt makes me feel somewhat like a beginner again. I’m looking forward to discovering what my 5th Dan self will be like, and I feel a huge sense of responsibility to be both worthy of the rank and the CHA students that I teach. Hapkido has always been that to me – a life long journey that continues to motivate me. I look forward to the next 30 years. ← Does the environment have an impact on our learning? Congratulation Saboumnim. Hope to one day being able to attain that myself. Congratulations Saboumnim – on becoming a 5th Dan Grade. It certainly is a great achievement, which you have obviously made positive commitments to achieve over many years. By the few classes I have attended as a beginner – your true skills and dedication can be seen. Good Luck with future grading! I wish you many rich moments with your new belt.